Sushi enthusiasts in New York tend to have a go-to spot. You love Sushi Of Gari? You probably lived on the Upper East Side at some point and don’t worry too much about your monthly credit card bill. You’re always at Momoya? You probably live in one of those big buildings in Chelsea and definitely have a favorite teacher at SoulCycle. You’re a regular at Sushi Yasuda? You’re either a celebrity or someone who’s had a personal food blog since 2006 – either way, you love that the chefs here know you by name. So who goes to Ushiwakamaru? For decades, Ushiwakamaru had two main draws: 1) It was more under the radar than the city’s other best sushi spots, located in an almost dingy, but charming hole-in-the wall space on West Houston. 2) It was less expensive. The crowd was harder to pin down and make sweeping generalizations about, but the sushi was always top notch, and that meant a dedicated following. And now you can forget all – or at least most of – that. After a long run in Soho, Ushiwakamaru has moved to West Chelsea, and after checking out the new digs, we can report that things are different now. First, the space is bigger, and fancier, with a very long sushi bar. It’s nicer, but also feels a bit less homey, and more sterile. Second, it’s more expensive. The omakase, which is now required if you sit at the bar, starts at $100 for 14 pieces. The simpler nine-piece nigiri platter, which used to hover around $30, is now $48. With soup and dessert included, it’s still a non-outrageous deal, relatively speaking, but it also means this place isn’t really the “cheaper” option it once was. The good news is, even if Ushiwakamaru has lost its price conscious and hole-in-the-wall defining characteristics, the sushi is still excellent. Ushiwakamaru isn’t going to be everyone’s go-to. But if you hang around 9th Avenue and don’t mind paying up a bit, it could certainly be yours. 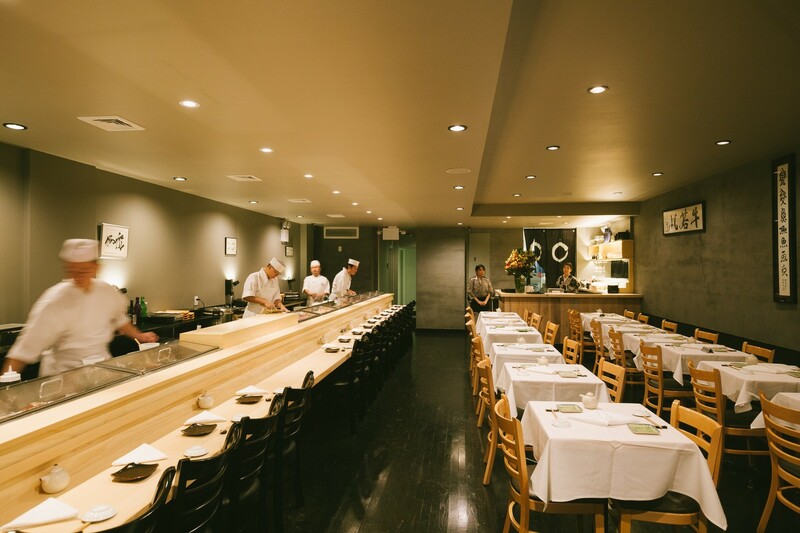 If you sit at the bar, which you should, this is your only option – and it starts at $100 for 14 pieces of nigiri, plus a soup or salad and a dessert. That sounds like a lot, but the pieces are relatively small. The chefs really do know what they’re doing here, and it comes across in every bite. A more price conscious option at $48 (though there are fewer pieces). If you’re not sitting at the bar and willing to stick to the standards – toro, salmon, eel, etc, it’s not a bad way to go.